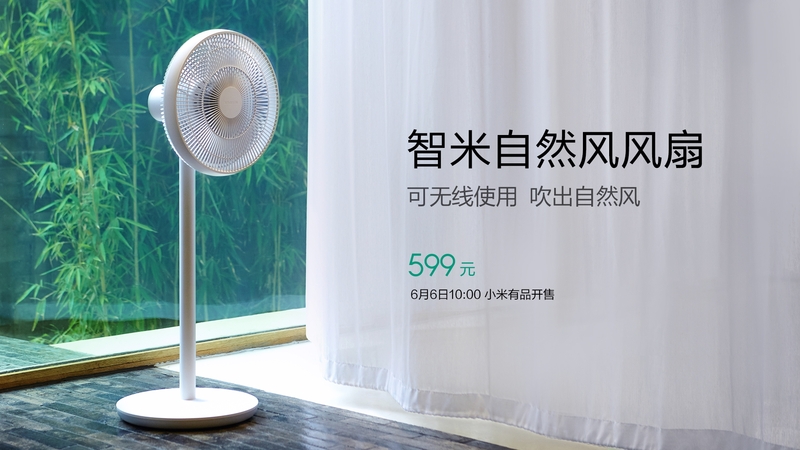 Xiaomi ecological chain enterprise – smartmi Zhimi technology, today officially released its second generation of floor fan products – Zhimi natural wind fan. The new product not only continues the full functionality of the new generation of fans, but also has lower power consumption, lighter weight, independent remote control, and more gameplay including voice control, while pricing is more affordable, only 599 yuan. It has been reduced by 200 yuan compared to the previous generation. By adopting a self-developed simulation natural wind randomization algorithm, Zhimi natural wind fan can restore the natural wind sense to the maximum extent. This kind of wind speed change is completely random, and even if it is the same product and at the same time, the natural wind curve produced is also very different, and it highly restores the nature of “natural perceptual change” in nature. In order to ensure smooth and smooth natural wind speed changes, Zhimi natural wind fan adopts variable frequency DC brushless motor. This motor can not only achieve stepless speed change, but also eliminate the sense of frustration when the wind speed changes. By using APP, Zhimi natural wind fan can carry out delicate wind adjustment up to 100 stops. On the other hand, this product continues its previous 7-blade design. Compared with the traditional 3-blade fan, this kind of blade can cut the air flow more evenly and make the wind more comfortable. At the same time, it brings down to 30.5. dB(A) mute performance. At the same time, the built-in 33.6Wh lithium battery has a battery life of more than 20 hours at 1 block wind speed and 120 degree swing. It has increased about 4 hours compared to a generation of products, and it can cover all-day wireless usage requirements. . Compared to the first generation, Zhimi natural wind fan has lower power consumption, the product has a minimum power of only 1.8W, equivalent to more than 500 hours of operation per kilowatt hour , continuous use throughout the summer, users need to pay for this electricity is almost negligible Excluding. Thanks to its built-in battery design, the use of Chimi Natural Fan has been greatly expanded. Whether it’s cooling in the balcony, cooking in the kitchen or bathroom shower, it can be moved to the desired location wirelessly even in an outdoor picnic or at home. use. Zhimi natural wind fan weighs only 3.6kg and is very easy to lift and move. Zhimi Natural Fan continues the consistent design style of smartmi products, and refines and refines some of the details. A generation of fans only provides two buttons for mode conversion and Wi-Fi connection on the airframe, while Zhimi Natural Fan provides four buttons, allowing most functions including natural wind switching and swing angle to be directly Make adjustments without using the mobile phone APP. Not only that, Zhimi Natural Fan also added a Bluetooth remote control, which can be remotely controlled without having to align the product, and the experience is superior to the traditional infrared remote controller. Zhimi natural air blower uses a lightweight aluminum alloy pillar surface for spray treatment, with excellent texture and comfortable feel. The steplessly damped shaft that controls the pitching of the fan head adopts the same structure as the notebook shaft, and can freely adjust the pitch angle according to his needs. In addition, all molded parts of the body shell are made of anti-ultraviolet ABS material, which is not easy to turn yellow and aging under long-term exposure to sunlight. Similar to the previous generation, Zhimi Natural Fan will support the connection of APP and APP. In the mobile phone APP, the user can achieve complete control of the fan, including 100-speed wind speed adjustment and child lock, etc. , and can enable the product to be linked and controlled with other smart products in the Mi family system to achieve smart objects. It is worth mentioning that the Zhimi natural wind fan also supports the millet love speaker for the first time, the user can achieve AI depth control through the voice, including switching the direct wind and natural wind, adjust the wind speed, switch swing, custom shutdown countdown And so on, even tailored to their own needs, tailor-made smart scenes. Including the airframe, APP, remote control and voice, Zhimi natural wind fan provides up to four kinds of control methods, covering most of the daily use scenarios of the user, and the convenience of operation is greatly improved. Zhimi natural wind fan will officially launch the millet product platform for sale at 10:00 on the morning of June 6. At the same time, the Zhimi line experience shop in Beijing Yandi Port will also sell the product at the same time.